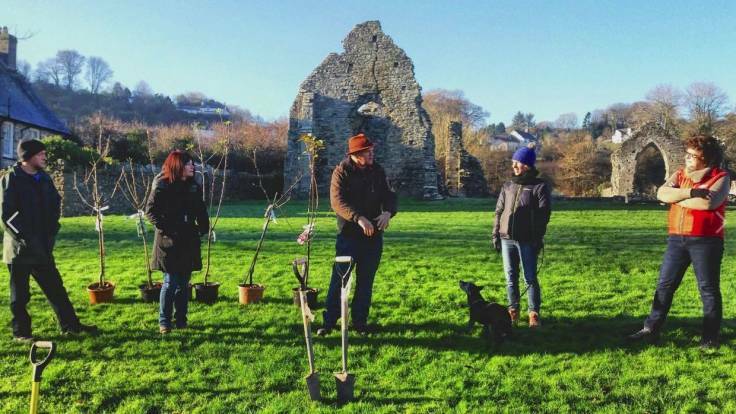 After giving my first ever forest garden talk to The People’s Orchard back in March, Nia asked if they could have tour of Forest Garden Wales own forest garden. I hadn’t thought that people would be interested in a developing forest garden. We started planting canopy trees and windbreaks two years ago, and are about halfway through planting the ground cover and shrub layer. This time of year, all the trees look like sticks! Apparently, the People said Yes, that it was actually good to be able to see the planning and early stages of the garden. The feedback was so positive, we’ve decided to run forest garden tours this year. I thought maybe half a dozen Orchardoers would arrive on what started out as a promisingly sunny day and degenerated into all-too-familiar windy & cold combo day. In the event 15 Orchardoers arrived! That’s quite a lot of people, and they managed to polish off a fair amount of Vegan Chocolate Brownie! It was so good to have friendly, positive and engaging folk as the first ever visitors, as it helped shape ideas how to best deliver a forest garden tour, how to keep people’s interest and how to relate what you’ve learned to what they need. Hint: a map, chocolate brownies and a warm room help!